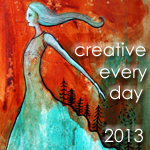 Ways to share: Once you've signed up, you can leave a comment on this post and/or use the "Mr. Linky" widget below to link to a blog post(s) about your creative activities during the days of 1/21/13 - 1/27/13. Theme: January's totally optional theme is Dark, which you read more about here. I can’t seem to find your Mr. Linky this morning, but wishing you a great week! It takes 21 days to create a new habit and I like this one! Creating art every day is awesome and every day brings something new. Just signed up and am excited to create. I think this will help good intentions from being neglected. Creating every day makes me think about being present, and from time to time I like to make this the theme of my creations and reflections. Excited to find the check in page! Can’t wait to see what everyone has worked on this week, and maybe get some feedback. I’m super excited to do this. Awesome! Thanks, Leah! Had quite the creative week, in spite of having pretty much zero time. Ah, the life of an artist mama! I love it. Finding my way around! Finally got my Dark Theme completed and posted on January 21, 2013! Making Progress! Blessings! Hi, everyone! Participating in this challenge in 2012 motivated me to create over 550 pieces of art…so it was a no brainer to sign up again! Thank you for the inspiration! It certainly helps me to have this as a motivational tool. For the month of January, my interpretation of ‘dark’ was to draw/paint dark-haired women, with tattoos and piercings…then a peacock motif sidetracked me…the some other tattoos took me another way…then I was working with some lyrics and quotes that included darks…my final two pieces (still in progress as of today) as closing up this series, including little hints of all the different imagery that I worked with this month.